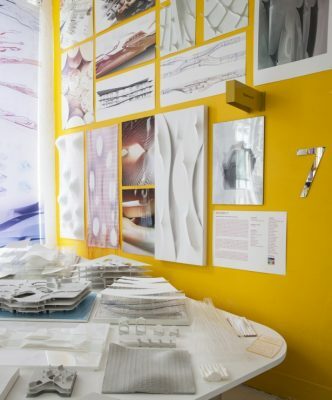 The narrow spaces of The Architectural Association at 36 Bedford Square seem incapable of containing the exuberance of drawings, models and installations produced by students during the AA’s 2016/17 academic year. Far from being highly polished and refined, the works on display rather convey the never-ending learning process that characterises architectural career paths. Among the projects that stand out, there are explorations on novel uses of materials, such as the application of cloth tailoring techniques to wood construction within the Design + Make programme based at Hooke Park, Dorset, and experimental woven structures created with computational design tools as part of the Emergent Technologies Master’s Programme: Emtech. A project called Gastronomy at KSEVT, which was developed as part of the AA Visiting School nanotourism in Vitanje, 2016. Please see the AA website and facebook page for the new AA Visiting School Slovenia nanotourism, which will be taking place 28 April – 13 May 2017. 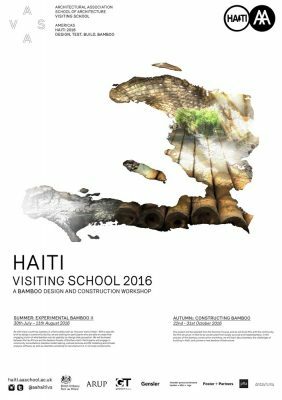 ‘Can bamboo alleviate some of Haiti’s problems?’ A question many ecologists, architects and engineers have asked at a time when Haiti’s forest coverage has reached 1.4%. Deforestation has destroyed rural economies and has removed lightweight timbers from the Haitian construction sector. The consequences of which were seen in the disproportionate devastation and death-toll of the 2010 earthquake. The fast growing material of bamboo is being increasingly seen as a solution not just in binding the exposed hillsides, but as a source of low cost, lightweight, and flexible material for construction. 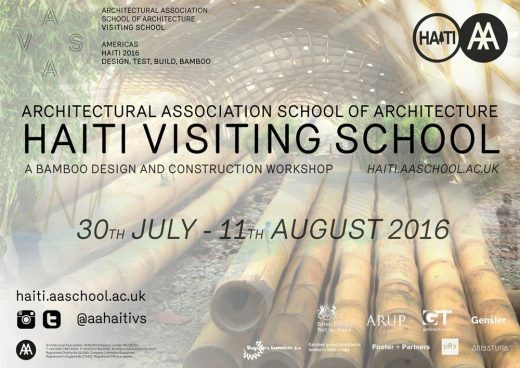 For the third year we will be investigating the potential of bamboo, through experimental architectural design contextualised for the climate, culture and geopolitical complexities of this Caribbean paradise. Participants will be asked not only to create a vision for a specific site, activity and community, but design a structure that can act a catalyst for a change in a national relationship with the material. With community discussion, cultural lectures and visits to three areas in Haiti participants will have a rare opportunity. They will embrace many aspects of this Country, whilst simultaneously learning about bamboo, new design methodologies, software, and construction skills as well as becoming members of the global network of creative discourse the Architectural Association affords. As with many countries, bamboo is unfortunately seen as ‘the poor man’s timber’. With a specific brief to design a community facility, we are looking for students who are able to create that engaging vision of what bamboo can do spatially to change that perception. The Architectural Association School of Architecture has opened registration for its newest AA Visiting School, held in Jordan on September 1st to 10th 2013. AAVS Jordan is an intensive workshop directed by Riyad Joucka, with the support of Visiting School Director Christopher Pierce and Visiting school coordinator Priji Balakrishnan. The 10 day program will be held within the period of 1st – 10th of September 2013. Registration closes August 20th 2013. Collaborating with some of the best up and coming talent in the current Generative Architecture community, iterative parametric platforms will be introduced to participants, and used to simulate natural processes. Participants will work towards generating speculative architectural proposals based on natural formations inherit within the ecology of the Jordanian desert. Initiating the design process, the group will take a trip to the rose-rock carved city of Petra and the desert of Wadi Rum, where man-made and natural morphologies will be observed and documented. With the objective of generating architectural solutions of a wide range of scales and programs, participants will digitally test their simulations to enhance the performance of their digital and physical design prototypes, operating in a feedback loop. This form-finding method aims at generating an optimal outcome through evaluating several iterations. The resulting architectural proposals should speculate on an ecological intervention within proposed sites of Petra and Wadi Rum, one that would emerges seamlessly from within its contextual conditions. “Inter-Scaless” is a two-week workshop where students develop parametric design strategies that enable them to generate design scenarios across scales, while focusing on a given conceptual framework. The challenge this year is to rebuild the relationship between the Houston’s Ship-Channel and the public urban structure of Houston, to generate a sense of place. Situated at the crossroads of Urban Design, Architecture, Environmental Design and infrastructure, this exercise will give participants the opportunity to develop their skills through different methodologies based on the exploration of local conditions, material processes, and the experimentation with digital fabrication and representational tools. The Visiting School is an opportunity to experience methodologies and ideas developed at the Architectural Association in a two-week intensive full time studio. Accurate scale replicas of Arctic ice floes are the centrepiece of a new exhibition at the Architectural Association in London. The Visiting school Mittelmeerland, a program of AA’s School of Architecture London, is seeking architecture students and young professionals to participate in the 10-day architectural research workshop in Algiers, Algeria from 11-21 Nov 2012. Mittelmeerland will investigate the future of the Mediterranean and research six different cities over three years. In this workshop we will study, how Algiers’s coastline is going to change in relation to the Mediterranean? What are the driving forces behind its rapid transformation? What is the vision for a city in need of modernization? The deadline for application is 1 Oct 2012. A small number of partial scholarships are available. Deadline is 24 Sep 2012. The teaching model of this Summer School is grounded on the experimental tradition of the Architectural Association and on the design philosophy of ecoLogicStudio, that will curate the event and co-run the design workshop. This exhibition explores for the first time the relationship between two seminal figures in 20th-century design. Lina Bo Bardi (1914–1992), best known for the buildings she designed and built in Brazil – the House of Glass (1950–51), Museum of Art, São Paulo (1957–68), among others – was a prolific designer, architect, writer and curator, committed to the promotion of the social and cultural potential of architecture. Before adopting Brazil as her home country in the 1940s, Bo Bardi lived in Milan, where she collaborated with renowned architect Gio Ponti (1891–1979). Ponti is perhaps better known as the founding editor of the design magazine Domus. He was also a productive architect, designer, writer and curator, having designed the famous Pirelli Tower in Milan (1950), and collaborated with many renowned designers (Piero Fornasetti, Pier Luigi Nervi among others) as well as organising many editions of the Milan Triennial exhibition of the decorative arts. Curated by co-founders of the Travesia Institute, Ana Araujo, AA tutor and Catalina Mejia, the exhibition focuses on the crossovers between Bo Bardi’s and Ponti’s approaches to design. It includes drawings, artefacts, film footage and writings covering the work of both architects. Sponsored by the Embassy of Brazil, London. Documentation of Lina Bo Bardi’s built works in the Brazilian cities of São Paulo and Salvador de Bahia including the influential Sesc Pompeia community centre in São Paulo (1977–86). Forthcoming: Special Event, Saturday 25 February, 2. See Lectures and Events. Homeless settlements exist here as liminal spaces – ghettoised counter-cultures, disregarded by the surrounding communities, and identifiable by the make-shift dwellings created out of found or donated materials as much as by the inhabitants themselves. Dwellings are hidden in woodland, under freeways, or on embankments where their occupants can live without fear of eviction, while others deliberately confront the society that has rejected them, with their conspicuous siting on roadsides, in industrial areas or public spaces. Murphy’s photographs focus on the habitats created by displaced and forgotten individuals in and around Reno, Nevada and the Californian cities of Los Angeles, Santa Barbara, Sacramento, Fresno and Ontario. The series of images examines how, with limited resources in insecure environments, a sense of home and identity is achieved and established through an improvised architecture, and how these temporary homes inevitably fall apart or are deconstructed to leave no trace of their existence. The Beyond Entropy project host a special event for AA members in Venice from Friday 25 to Sunday 27 November. The trip will include two private lectures held at the Giorgo Cini Foundation research centre on the Island of San Giorgio Maggiore with curators Adam Lowe and Jerry Brotton. Members will also be able to avail of a three-day pass to the Venice Biennale and can chose between attending one or more of the the three final Meetings on Art roundtable discussions of this year’s Biennale, or, exploring the Biennale sites across the city. Speakers include: Biennale Curator Bice Curiger, Hans Ulrich Obrist, Germano Celant, Biennale Director Paolo Baratta, Diana Baldon, Giovanni Carmine and Okwi Enwezor. In addition to the above those on the trip will get to spend Friday and Saturday night at the Centro Vittore Branca Residence on the Island of San Giorgio Maggiore. Members and students are invited to celebrate the reopening of the AA Archives in its new home in 32 Bedford Square. See www.aaschool.ac.uk/membership/benefits/events for full details. The V&A’s major autumn 2011 exhibition explores Postmodernism, asking what it means and where it came from, with reference to design in the 1970s and 1980s. Glenn Adamson will lead a small group of AA members on a private early morning tour, 8.30–10.00. This year, the 25th anniversary of the event, the architects’ mass will be celebrated at St Patrick’s in Soho Square, recently renovated by Javier Castañon’s practice (see AJ, 20 October). All Autumn Term Complementary Studies Courses this week (please refer to the timetable at the front of the Complementary Studies Course Booklet), available from the Co-ordinator’s Office, Second Floor, 36 Bedford Square. Symposium ‘Concrete Geometries – Spatial Form in Social and Aesthetic Processes’ which will take place at the Architectural Association on 15th October 2010 for possible inclusion in your calendar. The all day OMA Book Symposium scheduled for 28th May was postponed until the Autumn to allow all the contributors to attend. Renzo Piano gave a lunchtime presentation for an hour onsite on his first UK building to be completed.